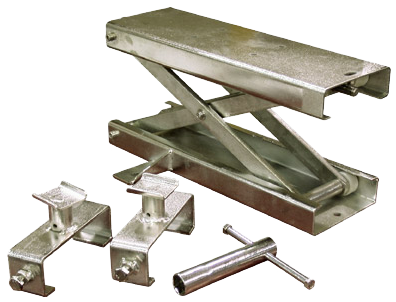 This small lift is perfect for raising any major brand of motorcycle off the ground. This allows you to easily perform wheel and tire maintenance. The lift is operated by a 7/8″ drive (handle included). It can also be operated by a standard ratchet or air gun. It raises and lowers quickly and easily, and it’s tough enough to handle the weight of just about any bike. It’s constructed of heavy-gauge steel and zinc plated. The T-handle is included. We also have free adjustable adapters.